Hello, hello 2019, hello you. One of my customers told me this week that according to numerology, 2019 is going to be super. So perhaps I won’t give up just yet! 2019 is a number 3 year and three is a pretty fine number for all that it symbolises. If you’re interested in that sort of jazz (or your interest is piqued) go here to Forever Conscious to find out more. In the spirit of “creativity, self-expression, and alignment” (did you look at that link?) I might write more personal posts, maybe show my paintings and other crafty concoctions as well as herby things. But…. I must admit, apart from time and other priorities the reason my blog posts have been so few and far between lately is because our camera is getting a bit on the old side and the plug points to load the photos on the computer are worn. So to get my photos loaded I have to ever so precisely hold the plug in at some special angle whilst pressing certain buttons (with my nose) and perhaps hold my head/feet/tongue at a particular angle whilst hoping the planets are aligned to be able to successfully get them on there. And still it doesn’t work. So I have to ask my husband to do it whom obviously has his feet in the right position and asks the right gods – because he can do it instantly. But I hate asking him, because as much as I love him he does this bloody eye roll thing or a loaded pause before saying the right words, which are “Yes dear, I’ll do that for you”. And it makes me want to shake him and sometimes I even hate him for about 40 seconds. Nobody likes that. And I’ve got other things to ask him to do – like saw off the chickens roosts because they’re riddled with mites (he can do it so much quicker than me). I can handle eye rolls then, you know, they’re kinda warranted! My “Turkenstein” Clary sage (Salvia sclarea) is in full bloom at the moment and is amazing. 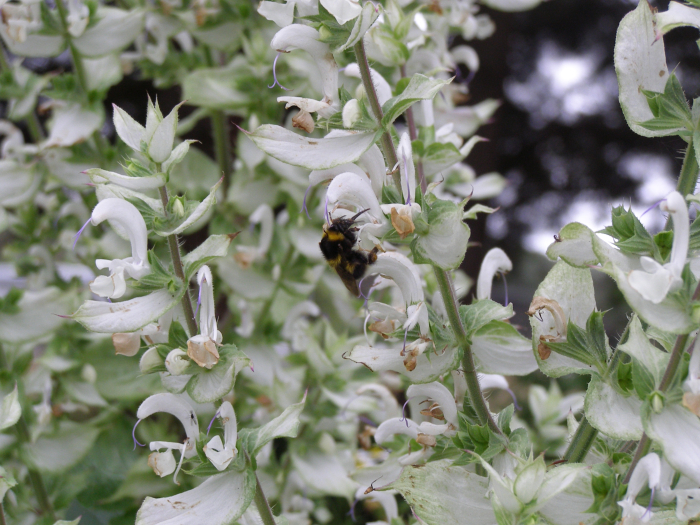 (Still have plants available, go here..) It gives you heaps of coverage, a beauts musky scent that really, only a salvia can pull off. 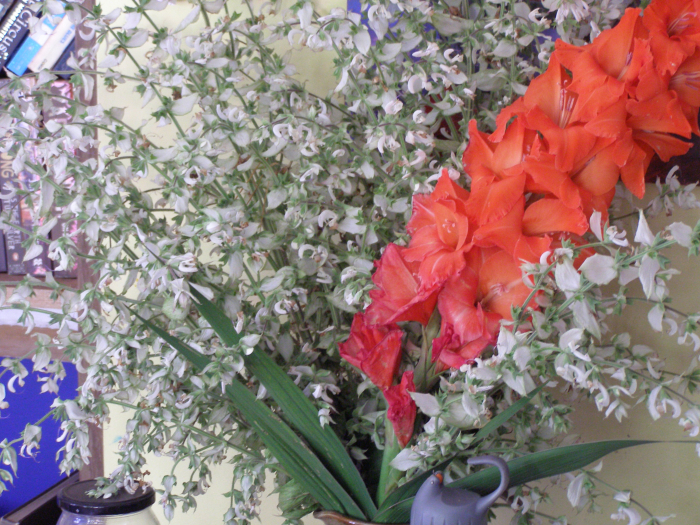 Flowers for bees and bumblebees AND any sturdy vase you have on hand. What have these guys been up to?! 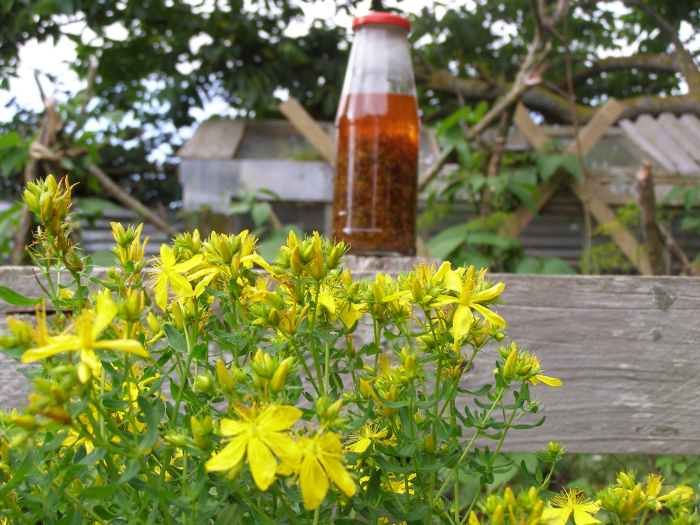 St Johns Wort (Hypercium perforatum) has been flowering steadily since Christmas and I’m starting my second lot of St Johns Wort oil. Fabulous for healing, here’s a link that will tell you more. 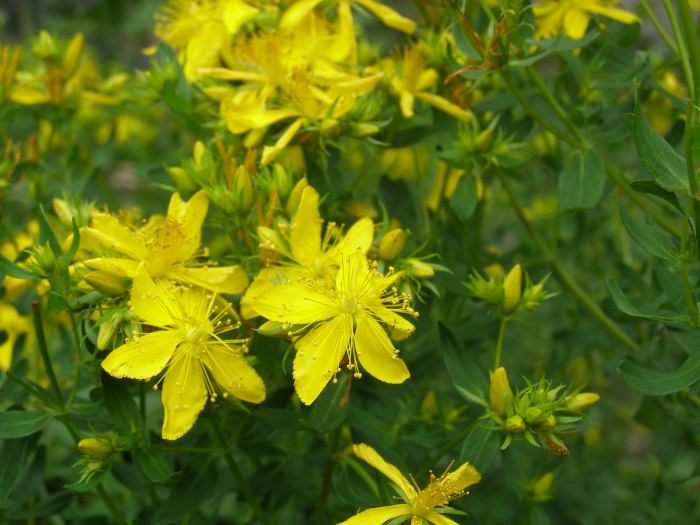 I grow St Johns Wort in my garden. It’s usually wildcrafted, but last year I couldn’t find any that wasn’t beside a dusty roadside, so I plucked a runner or two and set them in a bed. 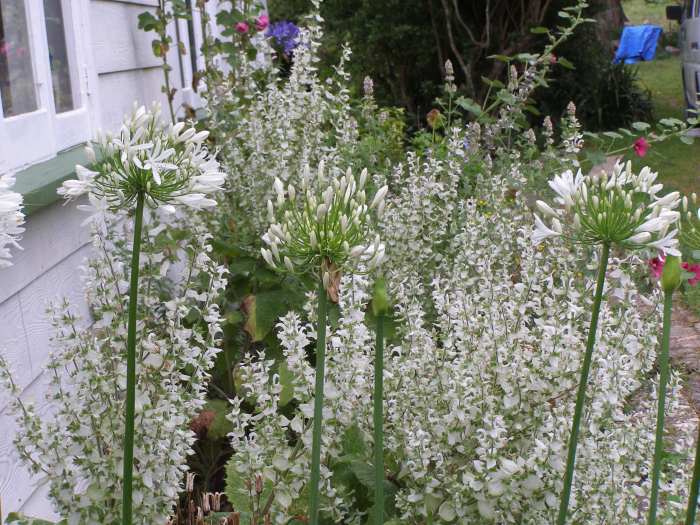 It’s been growing like the clappers and I’ve got to make sure I harvest as many flowers as I can or else the seeds will pop all over the place and become the invasive weed it is known as in some parts of the country. 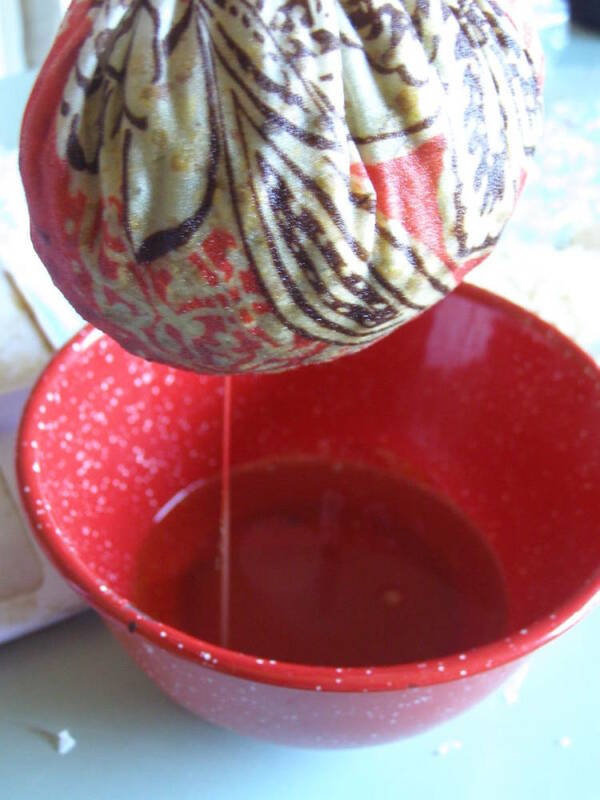 What doesn’t go in my oil I will snip and use as a fabric dye. 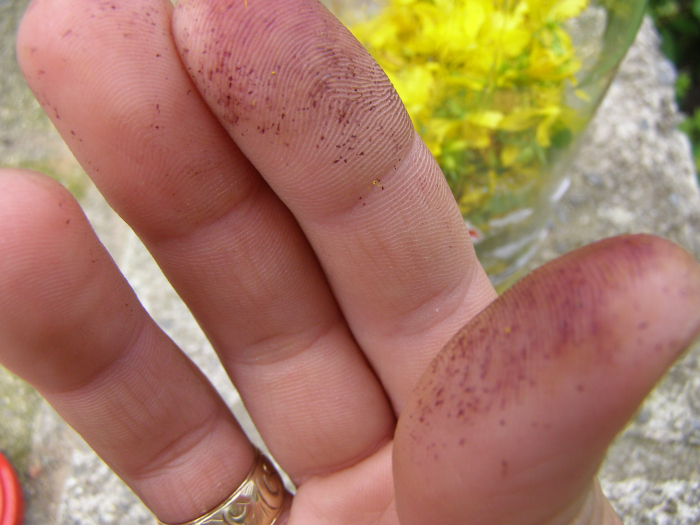 It takes two to three weeks for the redness to show through in your oil. During that time it should be in the sun, I usually pick everyday for a week then leave it be~ and then start another! I dare the cat that can reach this! 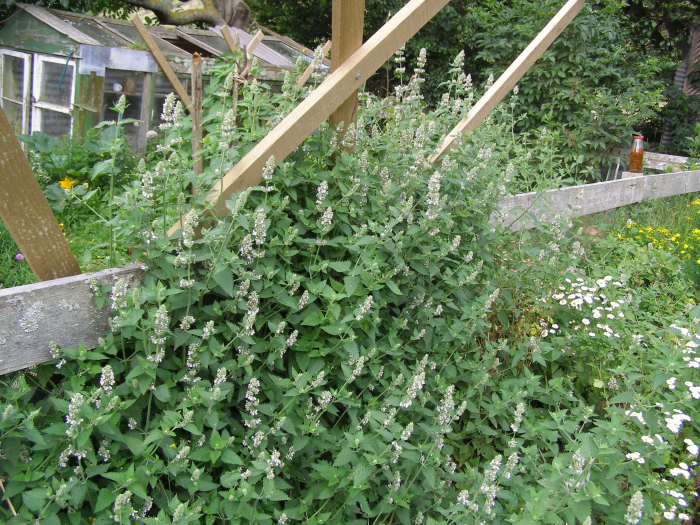 The above picture is a small portion of my Catnip (Nepeta cataria) that is now drying as we speak/read/write. Aghhh! 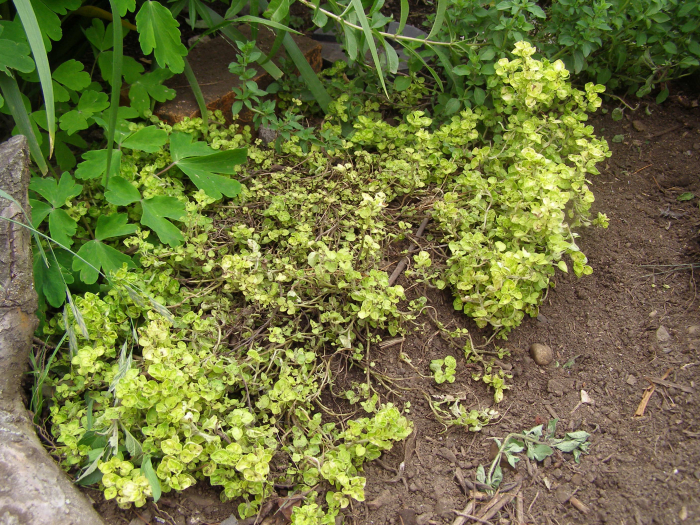 What’s happened to my Golden marjoram! 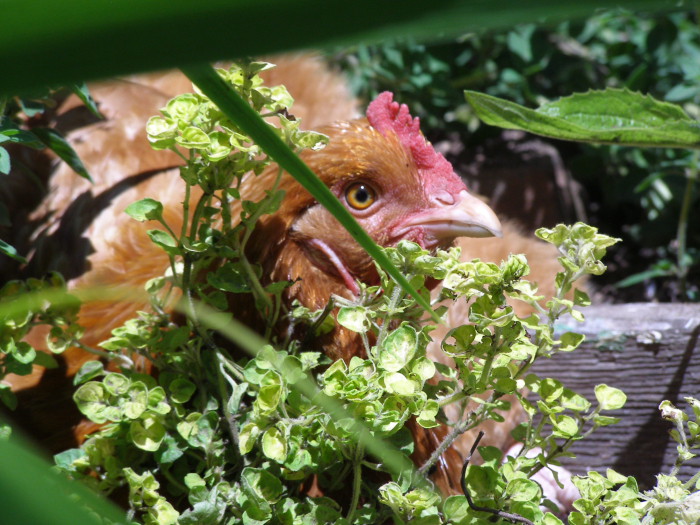 My clever chickens are self medicating themselves in the herb patch, luckily I’m a generous soul and I have this in other places where the chooks don’t go! PS. To be fair, I actually got a “Righty-o” when I asked my benevolent hubby to do the photo thing. We’re all good! It was my birthday the other day and I decided to give it a herbal flavour. When I got back from a super hot day at the markets I put some red wine in a carafe with wedges of orange, several texas tarragon flowers plus some lemon balm and mint that I bruised in my mortar and pestle. After leaving it in the fridge for a couple of hours and a more acceptable time to indulge, (ie. not 2pm…which actually is probably ok on a birth anniversary!) I took a sup and it was delicious! That Texas tarragon really gave it something else, even hubby quite enjoyed it when I forced him to try it, fortunately for me not enough to want a whole glass, te-he! Texas tarragon is lovely in a jug of water with lemon on a hot summer day too, leaves and flowers. If you don’t have this plant let me rest assure you that I will be selling it next season. I really hope that I’m not the only one that has to make their own birthday cake (despite other capable people in the house), ach well, at least I’m also the only one in the house that drinks red wine and doesn’t have to share whilst baking said cake! My favourite cake is lemon cake, beauts as is, but this year I added thyme from my new silver posie thyme (Thymus vulgaris ‘Silver Posie’). Was really nice, should’ve added more thyme though.. The next day we were at the Greytown Markets (as stall holders; we being Industrial Fusion at one end and Stoney Ground Herbs at the other) and I bought myself a lino print for my birthday by local Wairarapa artist Joanne Lysaght, Songbird, it makes me so happy! Wishing you all a very merry xmas, have a lovely time with your loved ones, keep an eye on your plants and make the most of everything you have in your life, including this lovely summer right now! Divide , Dry and Conquer! 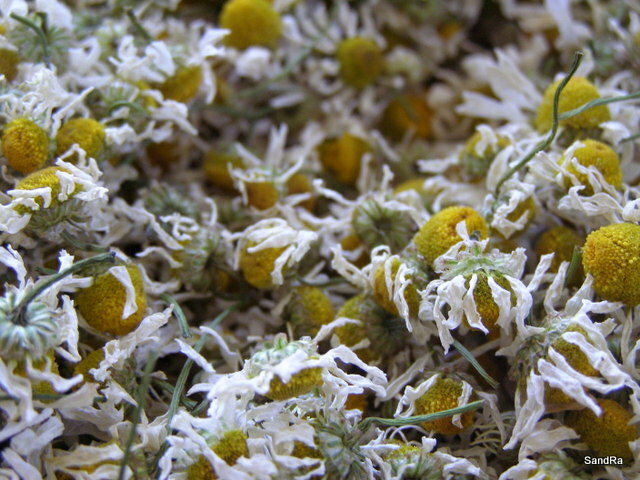 It’s now time to make sure you have enough dried culinary herbs in stock to last you through winter and to divide your clump forming or spreading herbs for fresh plants in Spring and Summer. 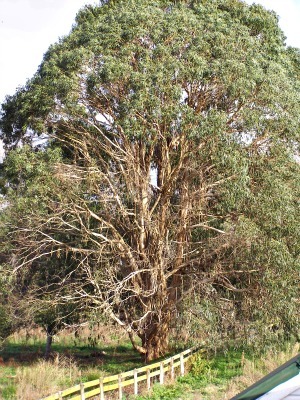 You can also start taking hardwood cuttings now. 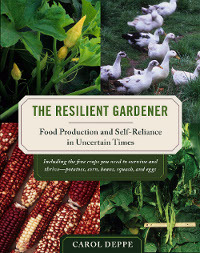 I’m reading a book at the moment called the Resilient Gardener by Carol Deppe. It’s fascinating and there’s some really relevant information in there for us gardeners at this time in this world. She talks about five staple crops to grow (and almost as importantly, to preserve and/or store) for “mega-hard” times; corn, potato, squash, beans and eggs. I haven’t finished the book yet so there’s still hope that she will mention herbs at some stage. I’m hoping she’s going to say how important it is to grow herbs for “mega-hard” times too. Two reasons; so that you have some darn flavour for your “staples” and so you have some medicinal supplies on hand, here’s a great post on what you can easily grow for the cabinet as such. So to dry your herbs- and I’m just talking culinary leaf here, medicinal has a few more specifics that I’ll cover another day.. In an ideal world you would harvest just before the flowers bloom, in the morning after the dew has dried on the leaves and during a full moon. Also ideally you would’ve done this all by now! But all is not lost, lemon verbena is still out there, I’m sure your oregano has sprawled left right and centre, thyme, your salvias. May as well harvest all of your stevia unless you have it in a pot and are bringing it indoors. Harvest peppermint before it hunkers down for winter. For home use (and quantities) the hot water cupboard is the perfect place for drying your herb. Lay them evenly on a sheet of newspaper and check daily til they get to the crunchy stage. Store them in labelled dark glass jars- in an ideal world! Clear glass is fine as long as they’re stored in your pantry and not out in the light though. Failing the hot water cupboard you can dry them in a very low heated oven or if you’re fancy pants, a dehydrator. And of course there are other ways to preserve your herbs, in vinegar, in olive oil, in pesto or in the freezer~ How do you preserve yours? 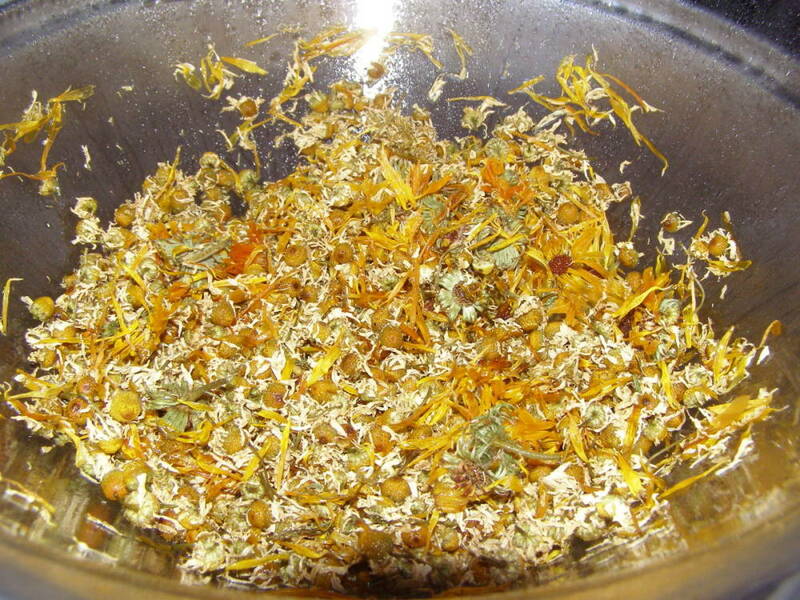 I’m going to try to be a bit more regular here than I have been of late… so with that in mind, next week I’ll do a post on how to divide your herbs, or, how I divide my herbs!! Who else loves lemon verbena? Delicious as a tea ever thought of it as a deodorant??! As the weather warms up it’s time to think of these things! 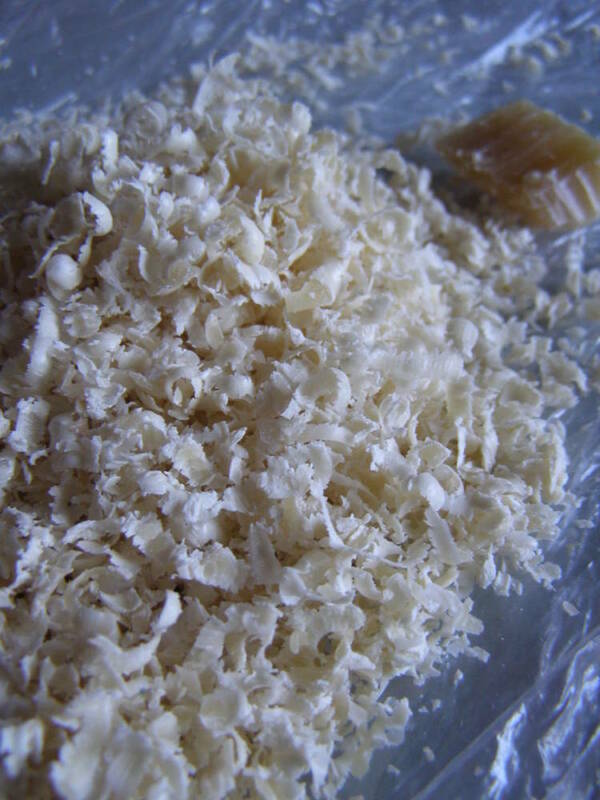 I came across a simple super recipe in Johanna Knoxs’ book A Forager’s Treasury. All is required is baking soda and dried herb/s of your choice. They must be well dried as baking soda absorbs any moisture. I made mine in a jar (1/2 cup baking soda) then stuffed it with dried lemon verbena leaves which I then shook anytime I walked past it (in the kitchen) for a good few days. Though I’ve just re-read the recipe and I should’ve crumbled or pounded the herbs first! Ach well, I sieved mine when I thought the time was right. So you apply it under your arms with a cotton wall or pad, or like me a home-made pad (it was going to be a breast pad!). But my real genius moment, after having issues with getting it out of the jar on to said pad, was remembering that deep in an un-packed box was one of my grandmothers un-used compacts. Perfect! 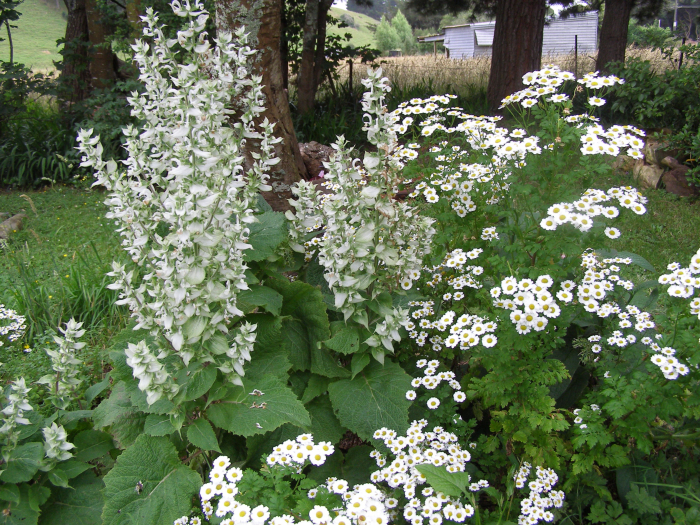 My lemon balm (Melissa officinallis) is in full flush at the moment. Unfortunately it’s not that terrific dried..that lovely lemoney goodness gets lost with the drying process. So apart from drinking it as a fresh tea or putting it in the kids bath to induce sleepiness (ha! 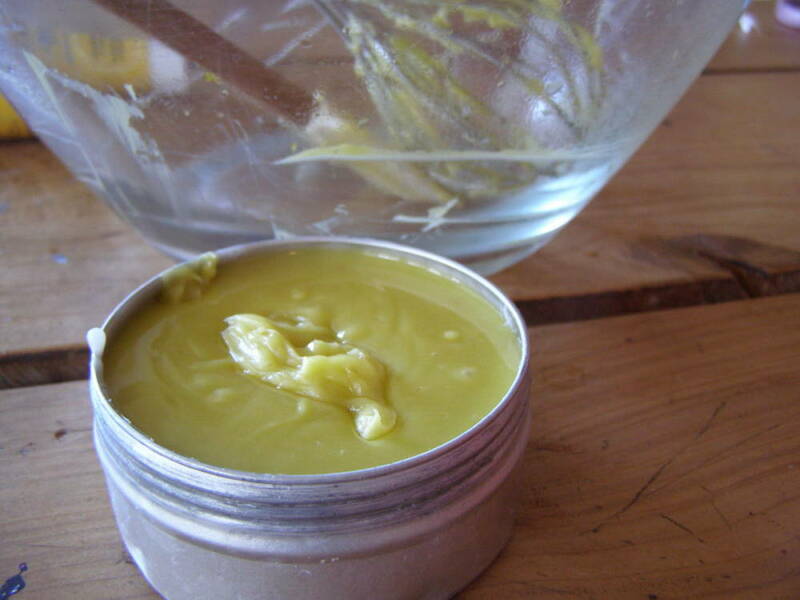 ), I’ve made a balm to tackle cold sores (my husband and eldest son are prone to them). 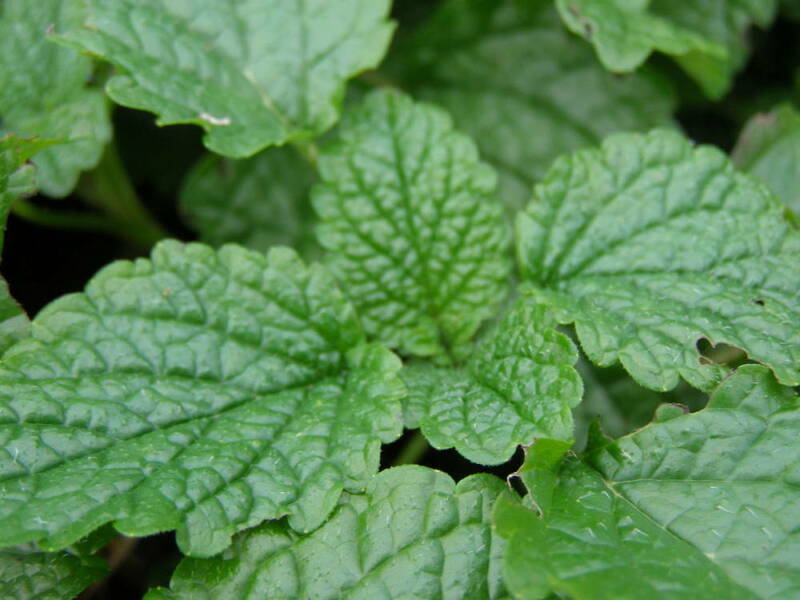 Lemon balm with its anti viral properties is highly effective in combating cold sores. I’ve made an infusion of lemon balm before and dabbed it on my poor sons lip and it healed in super quick time. Which is what inspired me to make something that will always be around ~ as lemon balm tends to die back or at least get a bit scrappy during winter. I decided to beef it up with eucalyptus and fresh ginger, I chose these herbs for their anti-viral properties. 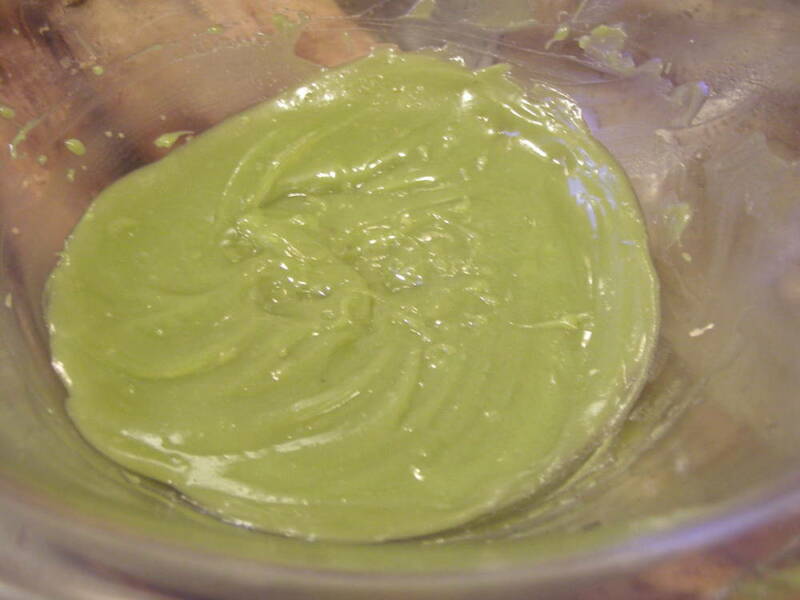 It turned out a glorious green colour. And I’m freakin’ stoked to say that it works really well! It actually seems to be a cure-all as it’s good for athletes foot too! 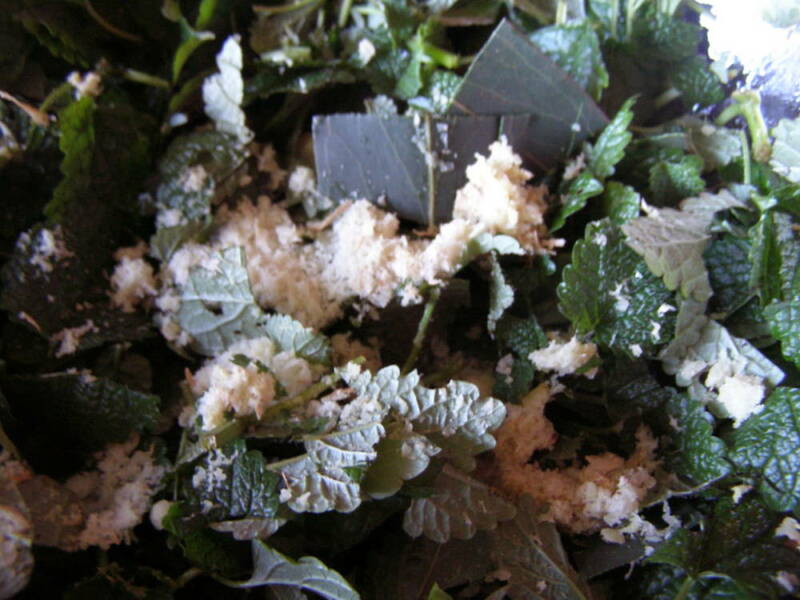 Quantities of herbs I used were; 110g fresh Eucalyptus leaves, 45g fresh Lemon balm leaves and stalks, approx 2 Tbl fresh grated ginger.